Brew your way through Southwest Ontario with these brewery discovery routes! Experience the finest craft beer, cider & culinary itineraries and explore the unique taste along the brew routes in Middlesex County. Hop on your motorcycle and enjoy a ride through Middlesex County. With the perfect combination of wide open spaces and interesting tourist destinations, you will no doubt enjoy your trip through our wonderful area as part of our regional Cruise the Coast motorcycle trail. Don't forget to plan and extra trip over the 2nd weekend in July so that you can catch Baconfest in Lucan, Ontario. With a theme like "Everthing Bacon and Bikes", you can't help but join in the fun. It’s never too soon to plan your next ride. So think about riding along Ontario’s South Coast. 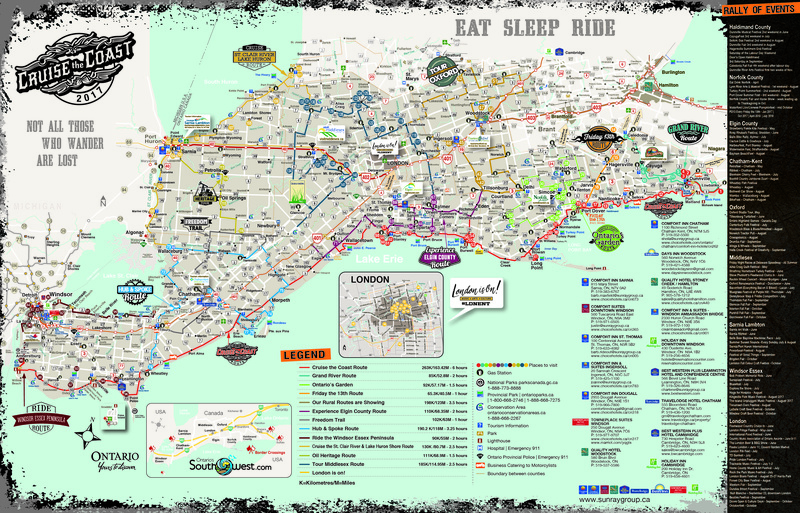 Our 2015 Cruise the Coast Motorcycle Map shows you the rider-approved routes and biker-friendly stops linking places such as Port Maitland, Port Dover, Long Point, Port Stanley, Wheatley, Woodstock, Point Pelee and Point Edward. The new map includes Haldimand, Norfolk, Elgin and Chatham-Kent, Windsor-Essex, Oxford County and adds two more areas: Middlesex and Sarnia-Lambton. Fresh foods from the farms and fields of Middlesex County and London. Enjoy the many delicious fresh fruits and vegetables, meats, preserves, breads, beverages and more made available. Find Your Way Around Middlesex County Discover all that Middlesex County has to offer! With 8 different municipalities, there's a lot to explore. View the Interactive Middlesex County trails guide from the website link below or download and view the printable PDF version. The Middlesex Heritage Trail has preserved the history of the many people, places and events that are uniquely significant to our local area. Take a drive, learn about our past, and discover the many wonderful buildings and sites that chronicle the history and lives of the early settlers. Your comprehensive directory of fun, exciting and interesting things to do and places to stay in Ontario. Whether you live here or are travelling to the province, you'll find new regions to explore and adventures/activities to experience in the Greater Toronto Area, Ottawa, and Niagara Regions, as well as in Eastern, Central, Northern, and Southwestern Ontario. Families, friends, individuals, and couples, young or old...if you looking for something great to do or somewhere perfect to stay in Ontario, you'll find it here!